Air New Zealand's Shanghai based cabin crew, who are Chinese nationals, are underpaid. In fact, that's an understatement. They are paid roughly one-quarter the salary of their Kiwi counterparts -- an amount that is less than the minimum wage in New Zealand. Why should Chinese cabin crew doing the same work, on the same aircraft, on the same route as New Zealanders, be paid less? In addition to their salary, cabin crew are paid per diem allowances for time spent away from their home base. Air New Zealand's Chinese cabin crew earn a per diem allowance that is only one-third that paid to New Zealand nationals. Why are the Chinese cabin crew assumed to need less than New Zealanders to cover their meals and other expenses when they are overseas? Keeping in mind that the Chinese cabin crew work alongside New Zealand crew members, doing identical work, this pay disparity is discrimination of the worst kind: Clearly, it is exploitation. New Zealand's government owns the majority of shares in its national carrier, making this situation even more scandalous to my mind. Recent news stories about this situation, including one published a few days ago by the New Zealand Herald, recount further details. NZ flight attendants have a starting base salary of at least $24,000 a year. A source said crew also got $170 for each day they spent overseas, plus other flight allowances, which could add up to $15,000 a year. The Chinese have an annual wage starting at $6240 and a daily away allowance of $55. One Chinese air stewardess said her monthly base salary was $520 and she got an extra $4.30 for every hour of flight time. This totals much less than New Zealand's legal minimum wage of $11.25 an hour. The carrier has attempted to excuse itself from responsibility by pointing out that the Chinese cabin crew are not direct employees of Air New Zealand; rather, they are employed through a Chinese staffing agency. 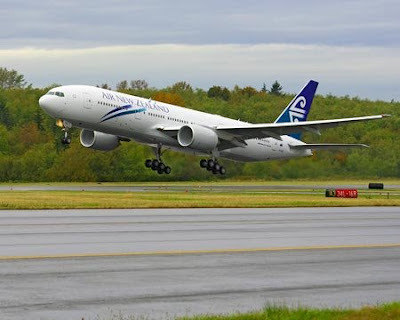 Nevertheless, each reportedly has a New Zealand work permit, listing Air New Zealand as the employer. So then, why are they not paid according to the standard set for New Zealand employees? Air New Zealand is not the only international air carrier engaging in this type of exploitation of Asian cabin crew members. For example, just last week I wrote about a trial, scheduled to take place today in Copenhagen, in which Scandinavian airline SAS is accused of having paid sub-standard wages to the 34 Chinese and 31 Japanese cabin crew hired since 2005. Those flight attendants were hired by SAS without Danish work permits, allowing the carrier to avoid paying them according to Danish standards. The feeble defense put forth by SAS, quoted in news articles, was that "the women were only in Danish air space for the few minutes it took to fly over the small Scandinavian country," and therefore were exempt from needing Danish work permits. Rubbish. All of these kinds of cases boil down to carriers attempting to cut costs at the expense of their employees' welfare and dignity. We all know that, with fuel prices and other material costs soaring, these are tough times for the aviation industry, but any temporary economic advantage these companies gain by paying grossly substandard wages to certain employees based on their nationality is greatly overshadowed by human rights issues. Since when is blatant exploitation good corporate policy? What has happened to the concept of equal pay for equal work? for your info the court ruled against Scandinavian airlines, but the government is now trying to change the law. the government has shares in SAS and thereby partly owners. Thank you for that information. I appreciate it, and I'm sure the readers do, too. for your info Scandinavian Airlines have temporarily stopped using chinese cabin crew until further notice. They are awaiting the new law by made by the Government(partly owners)and Parlament, and awaiting the case in the court case about using illegal workers according to the present law. Thank you for that additional information.